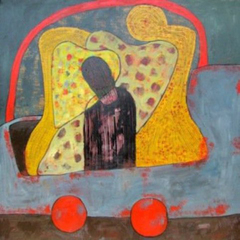 The guest gallery exhibit features paintings by Kerima Ahmed, a full time studio artist based in Addis Ababa, Ethiopia. Ahmed’s paintings are non-representational and her approach is reminiscent of traditional Ethiopian painting, composed of geometric shapes and forms filled with flat colors. The exhibit also includes a collection of Shona Stone Sculpture from Zimbabwe. Shona sculpture is widely accepted as the most important art movement to emerge from Africa in the twentieth century. The polished modern forms, the virtuoso carving, and the beauty of the stone allow these pieces to represent people, animals, plants, and social values with emotional expressiveness and aesthetic elegance. The Shona believe that everything, including stone, has a ‘life spirit' and that by carving the artwork they are ‘releasing the spirit from the stone'. This collection of sculpture comes from a nonprofit agency called House of Stone that supports artists in Zimbabwe. Over 95% of funds raised go back to help the children of Zimbabwe, particularly AIDS orphans.